What is China going to do amid growing tensions around Iran? What’s the status of Russia-China relations? GRU veteran Andrey Devyatov, one of the leading experts on China, talked to RT about these and other questions. 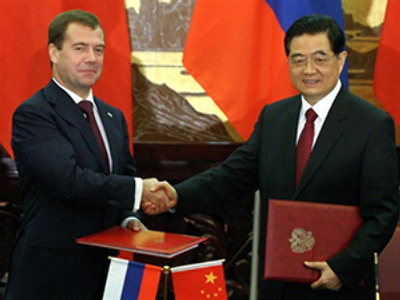 Russian President Dmitry Medvedev went to China on a three-day visit. He visited a Russian memorial cemetery in Port Arthur (Lushunkou in Chinese; currently a district of Dalian), signed a number of key economic MOUs with China and opened “Russia Day” at EXPO 2010. RT: What is the current status of relations between Russia and China? Andrey Devyatov is a military expert on China and the author of numerous books and essays. He lived in China for 17 years. In 1999, he was expelled from China for “activities incompatible with his status” and banned from entering China for the next seven years. Mr. Devyatov is deputy director of the Institute for Russo-Chinese Strategic Interaction. His works include “China’s Peculiarities as I Learned Them in Intelligence and Business,” “The Chinese Breakthrough and Lessons for Russia” and “Practical Chinese Studies.” His book “Uranopolitics” has been translated into Chinese. 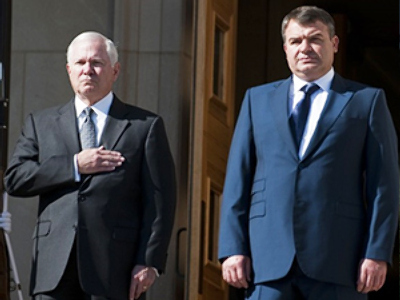 Andrey Devyatov:Both parties claim their relations are better than ever. In reality, though, they are very insincere about it. China wants Russia to be its strategic rear base in China’s confrontation with the United States. A rear base is where fuel and raw materials are stored, where new weapons are designed. A rear base is something you can rely on, something to fall back on. Russia, for its part, fears China’s demographic expansion to Siberia and the Russian Far East because Russian territories east of the Urals are underpopulated and because Russia has lost its industrial and military power. So, speaking again and again of “everlasting friendship,” Russia strives to maintain the appearance of good-neighborly relations. Also, Russia tries to use its seemingly warm relations with China to play the Chinese card in its relations with the United States and NATO. So, while outwardly Russia and China swear to remain best friends forever, their relationship is becoming increasingly tense. RT: How does the United States influence relations between China and Russia? From time to time, Russia gets caught up in the groundless fear of the “Chinese invasion.” Is this part of that influence? 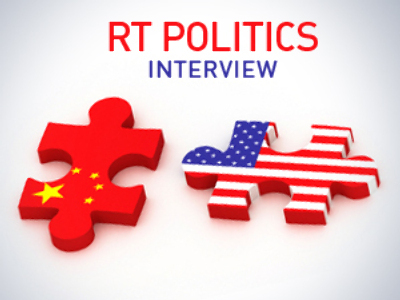 AD: The United States has been quite successful in playing the Chinese card against Russia. Its crude propaganda and subtle diplomacy contain a modicum of truth, and truth, if not covered with flattery and hypocrisy, is always bitter. The United States is distracting the authorities, business and public opinion in Russia from the essence of US-Chinese relations, i.e. “global comprehensive positive cooperation,” which the United States calls the G2. As a result, Russia is seriously thinking of expanding its cooperation with NATO. AD: After the two countries normalized their relations in the late 1970s, their relationship has been described as “constructive cooperation.” The essence of this relationship is a peaceful arrangement (i.e., without the threat of war) of deals on the market of global geo-economics, where China acts as the manufacturer, the world factory of industrial goods of the 21st century, and the United States is the main payer and consumer of the goods produced by the Chinese factory. Since the market is a buyer’s market, not a manufacturer’s market or a seller’s market, the US seeks to establish the dictatorship of the consumer. China, on the other hand, skillfully demonstrates its strategic independence from the United States, because, having a population of 1.5 billion – i.e. 1.5 billion consumers of its own – it can always retreat from the world market and fall back upon its domestic market. The only aspect of the American dictatorship that China is not able to counter yet is the measure of value used for its goods, and for the raw materials and fuel it uses, as China has to purchase those abroad. That measure of value is called US dollar. RT: Does China have leverage to counter US dictatorship? AD:If China is the factory of the 21st century, the United States is the technology laboratory of the 21st century. In addition to buyer’s and payer’s dictatorship, the United States pursues a policy of technological dictatorship. But China uses the network of its diasporas (Chinatowns) to obtain American technological secrets, sometimes legally and sometimes through covert intelligence methods. That’s why spy scandals erupt from time to time between the United States and China. Another method China uses to undermine America’s technological monopoly is the production of counterfeit goods. RT: Why is China in no hurry to join the Russian GloNASS project, using GPS in its air defense systems instead? Don’t they think that the US may turn off their satellite the same way they did with Iraq in 2003? AD:The Chinese are pragmatists. GPS is what works today; therefore, they use it. GloNASS is not ready yet, and nobody knows if it will work well when it’s finished. Furthermore, China has financial and economic leverage to influence the United States but it doesn’t have such leverage with Russia. Besides, China is developing its own satellite navigation system. Also, future wars won’t be fought between US aircraft carriers and Chinese submarines at sea. Today’s war is a network guerilla war with terrorists and extremists. In the future, there will be “combat molecules” which won’t require satellite navigation. RT: A month ago Putin opened a new oil pipeline to China, and now Medvedev did the same. The United States is very much against such ties between China and Russia. Does it pose a threat to Russia and China? AD: The initial plan in 2001 was to build a pipe for 30 million tons of crude oil in five years. Eventually, it was built in 10 years and its capacity is 15 million tons a year. Furthermore, China officially says it is concerned about “the security and proper operation” of the pipe. The United States, as the consumer of the goods produced by the Chinese factory, knows very well that it can’t leave the factory without raw materials and fuel. America wants to control the factory (i.e., its prices) through raw materials and fuel. That’s why the United States’ objective is to take control of the tap on that pipe, which may result in Russia losing its sovereignty. AD: Talks, promises and assurances have been going on and on ever since 2004. But even now, during Medvedev’s state visit to China, the parties failed to reach an agreement about the gas price for China. The problem is that China gets natural gas from Central Asian republics, members of the Shanghai (not Moscow!) Cooperation Organization, at prices that are 30% lower than what Gazprom gets selling gas to the West. Russia is building new pipelines to Germany and Italy – Nord Stream and South Stream. It is adding new pipes to Blue Stream. Deliveries to Europe through Soviet-era pipes in Ukraine, too, continue as before. So, I think all those talks about gas pipes to China are pretty much a bluff. Russia wants to play the Chinese card. This is not a “grand chessboard”; it’s a card table of history where more than two players are present. RT: Why did China join the sanctions imposed on Iran? Iran is the main supplier of oil and gas to China. China could have easily vetoed the sanctions. RT: If there is a war against Iran, will China stay out of it? AD:Yes. There cannot be a hot war between China and the United States.